Javi: Mark my words, for most of you cool cats in the know, this movie will be in your top movies of the year, if you care about that sort of stuff. If you know me at all, you'll know that I'm the type that hates hype. It just means a privileged few have super loud voices, and we're all supposed to follow along. I can firmly say that this movie is one of the few that lives up to the hype. This is a tight, stylish and all around fun movie. 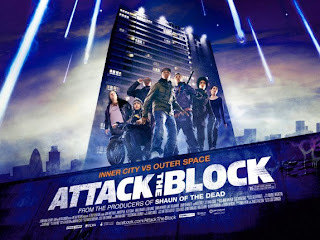 Some people might not find much new here, but when it comes to alien invasions/monster movies ATTACK THE BLOCK does it as best as it is going to get for a while. Before we get much farther, whenever you get a chance to purchase the soundtrack of this movie, do yourself a favor and do it. This time done by Basement Jaxx, it is up there with THE SOCIAL NETWORK score as well as the more recent HANNA by The Chemical Brothers. It's a very catchy sort of electronica that complements the tone of the movie perfectly. I know most of us stayed after the credits to just get to listen to it. On to the movie though, yes it is a great movie that does a great job of having fun action pieces with a very passive sort of character development that complimented the tone. I never expected a contemplative meditation on the influence of gangster culture on today's youth when I saw this movie. Instead, with the gang of thugs lead by Moses (really??! ), you get a glimpse of kids that are just complete assholes but have a sense of honor and tons of heart. It's kind of interesting how these kids are nothing but little nerds with knives that think they're tough. In the end, that's how all kids want to be perceived as. Something else that the movie does is balance the comedic tone with the more horror/thrilling tone of the invasion scenes. Now, while I am praising it, there are some problems with this movie. While you can look into the characters and make them more complex than you want to, there is the issue that when people die, it might not make as big of an impact on you as if you had spent a bit more time getting to know them. That aspect seriously bugged me quite a bit. Every death here is gruesome and violent, and that should warrant a reaction from the audience, but most of the characters seem to be stunned for a second and then go back to being goofy and cracking jokes. Overall, this is one of the best movies to come out in this year. It has a familiar concept that never feels cliche and is a great entry into the alien invasion genre. When other alien invasion movies concern themselves with the grander themes of allegorical communism or one-sided warfare and the fear of the unknown, this is a strong movie that gives the characters a chance to improve themselves through such a crazy event. Jonesy: Usually every year, there's a movie that comes along that just surprises the hell out of me. A couple years ago it was DISTRICT 9, last year was HOW TO TRAIN YOUR DRAGON, and this year, so far, it was ATTACK THE BLOCK. I had heard many rumblings coming out of SXSW about how fantastic this movie was, but like any indie runaway-festival hit, I take those with a grain of salt. Because, let's face it, by the time most of us other movie goers get the chance, the movie is so hyped that we're let down. I went as far as to not watch the trailer because I wanted to go into the movie as blind as possible. I knew the basic synopsis, and that the accents, at first, were a little difficult to understand. So...off we went. The brilliance of ATTACK THE BLOCK begins with the pacing. The movie goes from 0-60 in about three minutes and never lets off the breaks. At 88 minutes long, director and writer, Joe Cornish, has developed a perfectly paced alien movie. We follow a gang of teenagers from South London as they mug a nurse coming home from work, and as they're attempting to take her purse, a meteor crashes into a car. Turns out the meteor is housing some extraterrestrials. The gang quickly defeats the beast, then brings it along back to their apartment as a sort of trophy. However, they noticed that a few dozen more meteors have crashed in the area. So, they take it upon themselves to defend their block from an alien invasion. The plot itself has the makings of something really corny; however, Cornish's writing keeps us not only invested in the action but also the characters. Now, not all the characters have these deep layers, but each have their own quarks that make them memorable. The movie rests on its young star, John Boyega, playing Moses, as the leader of the gang who takes responsibility for making sure the aliens don't take over their block. Coupled with his quiet demeanor, he brings a strength and subtlety to Moses. Not an easy task for a young actor or really, any actor. This is not your parents coming of age movie, where times are tough so the kids retreat into a make-believe world. Initially, Cornish does something unthinkable with his protagonist gang...he makes them unlikeable. Our first encounter is them mugging a woman at knife point. However, the brilliance in the script is making the kids feel like real gang/family, and then watching them come together to take on the challenge of defending the only home and family most of them know. When the movie takes a breather from the action, we're treated with some very funny and quick character moments that keep adding to the picture of their characters, home life, strengths and weaknesses. ATTACK THE BLOCK takes the formula of a coming of age movie about proving yourself and breaking the stereotype set against you and makes it funny and hopeful.